This three inch moonshine still is created for those who wish to do medium batches. Medium meaning from 15 to 100 gallons of mash. The three inch moonshine still will produce product from 1 gallon an hour at 94 percent ABV. At 20% Mash. And produce 2-3 gallons an hour at 75-80% ABV. ( ALCOHOL BY VOLUME). 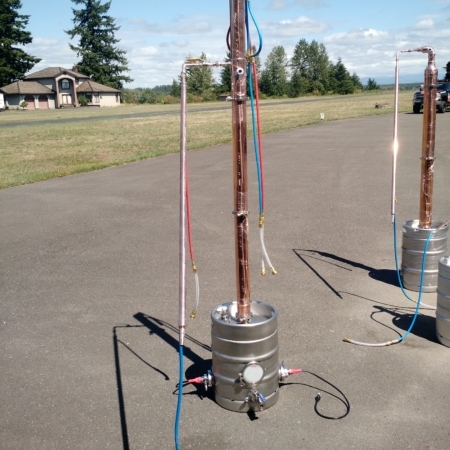 This still is perfect for those who are starting up a small or craft micro distillery having two or three of these distilling units running simultaneously. MAKE ETHANOL-I must mention for those who are in the production of Ethanol Alcohol, you can produce enough ethanol fuel in one day, to run your car for a week. The coil is made up of a ¼ inch copper tubing. 2 coils at 3/16 inch. So this works very efficiently taking the vapors to a liquid with low use of water. This moonshine still can also be used as a pot still by removing all the copper mesh packing out of the distillation column. This still can fit on a boiler with a 3 inch opening. If you have a 2 inch opening, just use a fitting reducer 2-3″. This is a large unit. Great for novice distiller who wants to become serious. Or those who wish to be independent from the oil industry for your ethanol alcohol. This moonshine still tower alone is 6 feet tall. It can be changed to be a pot still to make whiskey, rum and brandy and also, you can use it as a stripping still. Now add modulars to the still and you can maniupulate flavors and the strength of the ABV. You can take a product from your fermentation to the high 90s on the first run. Some have even said 95% including me. In stripping still mode with 5500 watts of power in a 15 gallon keg, you can push anywhere between 6 and 8 gallons an hour, in stripping mode. I have set up many distilleries running my stills as we speak for years, doing 65 gallons a day. They started off with one three inch still, and they have grown when the orders come in, and they are up to 6 stills running at the same time. It is true, under 5 Grand you can have a micro distillery! Producing two hundred cases month minimum.